As far as achievements go, this might be a small feat. But I can happily report that I’ve now succeeded in making all the recipes from the small promo brochure for the upcoming “At Hoc At Home” cookbook (Artisan) by legendary chef, Thomas Keller. Of the four recipes printed in this sneak-peek brochure, this one for “Leek Bread Pudding” is by far the richest. 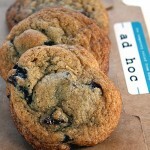 Richer than the Ad Hoc chocolate chip cookie recipe? Yup. 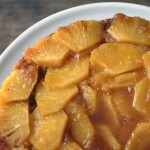 Richer than the Ad Hoc pineapple upside-down cake recipe? Uh huh. Not only are there three cups of whole milk in this dish, but there is also an equal number of cups of heavy cream. Yes, this may as far as it gets from a low-cal dish, but I’m here to tell you this decadent dish is far worth each and every calorie. You might be surprised that the rectangular baking dish used for this recipe need not to be buttered beforehand. But with such a copious amount of fat in the ingredients already, you don’t need to do so. You might also be alarmed at first by the large amount of liquid poured over the brioche cubes. But it all does get soaked up beautifully, so have no fear. With three eggs also in the mix, the bread pudding puffs up a bit in the heat of the oven. It emerges all crispy brown on top, and fluffy and custardy inside. 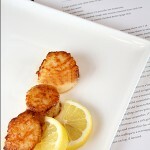 Indeed, it’s nearly souffle-like in texture, with creamy, soft, gentle leeks luxuriously flavoring it all. With this last one ever so supremely sumptuous, too, it may just satiate you until the actual book comes out in November. 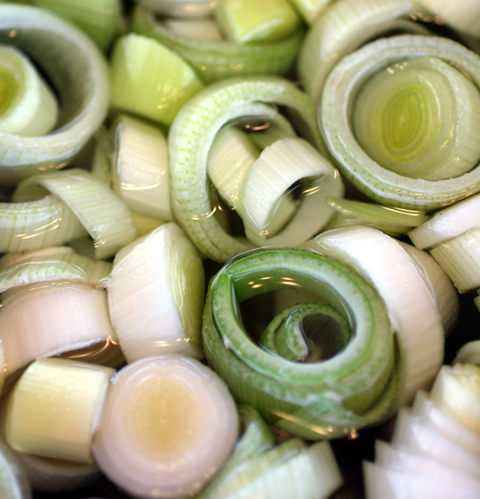 Put leek rounds in a large bowl of tepid water and swish so that any dirt falls to the bottom of the bowl. Set a medium saute pan over medium-high heat, lift the leeks from the water, and add them to the pan. Season with salt and cook, stirring often, for about 5 minutes. As the leeks begin to soften, lower the heat to medium-low. The leeks will release liquid. Stir in the butter to emulsify, and season with pepper to taste. Cover the pan with a parchment lid (parchment paper cut to fit the size of your pan), and cook, stirring every 10 minutes, until the leeks are very soft, 30 to 35 minutes. If at any point the butter breaks or looks oily, stir in about a tablespoon of water to re-emulsify the sauce. Remove and discard the parchment lid. Meanwhile, spread the bread cubes on a baking sheet and toast in the oven for about 20 minutes, rotating pan about halfway through, until dry and pale gold. Transfer to a large bowl. Leave oven on. Add leeks to the bread and toss well, then add chives and thyme. Lightly whisk eggs in another large bowl. Whisk in the milk, cream, a generous pinch of salt, pepper to taste, and a pinch of nutmeg. Sprinkle 1/4 cup of the cheese in the bottom of a 9-by13-inch baking pan. Spread half the croutons in the pan and sprinkle with another 1/4 cup cheese. Scatter remaining croutons over and top with another 1/4 cup cheese. Pour in enough of the custard mixture to cover the bread and press gently on the bread so it soaks in the milk. Let soak for about 15 minutes. Add remaining custard, allowing some of the soaked cubes of bread to protrude. Sprinkle the remaining 1/4 cup cheese on top and sprinkle with salt. Oh wow Carolyn. Every time you make a recipe from that book it ends up on my to make list. I try not to buy cookbooks anymore because I have no space and the selection at the library is pretty expansive and reliable but I would be lying if I said I wasn’t tempted to get this one. 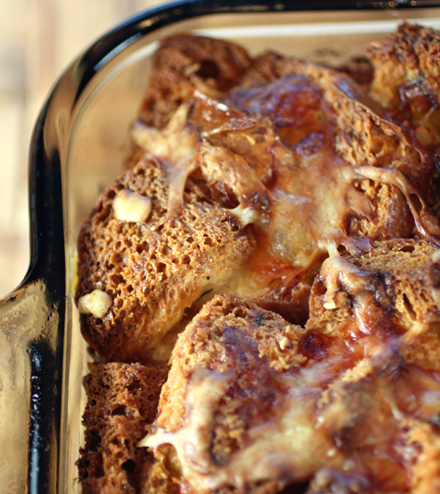 I’ve been sort of into savory bread puddings lately, and this sounds like a great one. This is perfect as a hearty brunch dish. Wow is right! All these sound great – and the cookies WERE delicious, all three times times we’ve made them. I just preordered the cookbook. Nov. 5! Sounds like a movie plot! Well, a mini-movie. 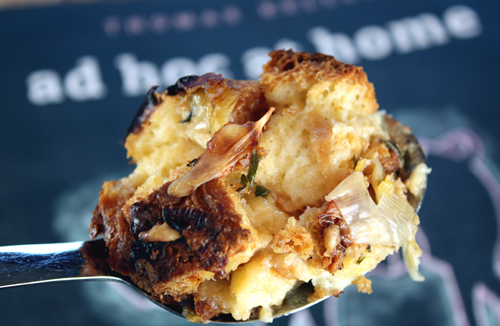 I love savory bread puddings and that one looks so delicious! Jen: Obviously, we need to all hang out at your house, if you’re baking endless supplies of Ad Hoc chocolate chip cookies! Hah! Glad you liked the recipe so much. Me, too. In fact, I might have to make another batch soon, as I’m feeling withdrawal pangs. I definitely need my fix. Funny how we rarely consider making a bread pudding savory. You could do this with any veggies. Sounds good! I’m a bit late to this party but I can still enjoy it! It may be time to stop eyeing those leeks at the market and actually pick them up . . . I just got the cookbook and it is beautiful!! I can wait to start using it….any other recipes stand out for you?